The Southside cocktail is a drink of legend. My favorite origin story goes like this: Prohibition era Chicago was a gangland split between the north and south end of town. The gangs in the north cornered the liquor market and imported quality spirits from Canada. Gangs in the south, notably Al Capone, relied on spirits made in bathtubs. Gin, being one of the easier home brews, became the popular drink of the time. 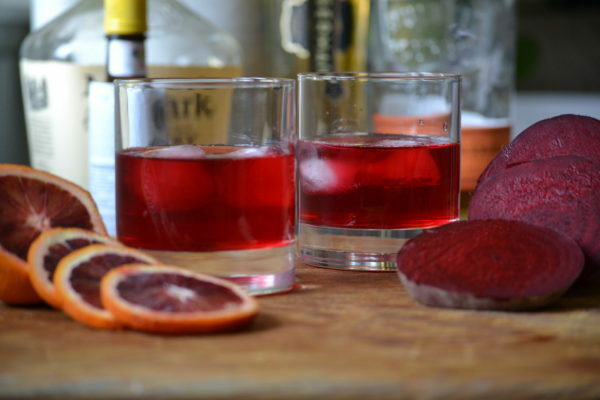 To improve the quality of these spirits, bartenders mixed them with citrus, sugar and strong herbs. Thus, the Southside was born; a gin, mint, lemon and soda water cocktail. The Southside is normally considered a summer drink and popular with preppies who sip it a Northeast country clubs. 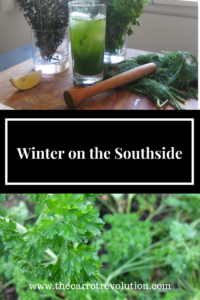 For this take on the Southside I remove the summer mint and replace it with herbs that I grow in the winter. The result is a very herbal cocktail. Thyme: Thyme is a perennial so not only grows in the winter but year round. Varieties used for landscaping are becoming popular but for the edible garden look for English or lemon thyme. Dill: A beautiful plant with wispy leaves, dill grows easily from seed and will self-sow in the garden. 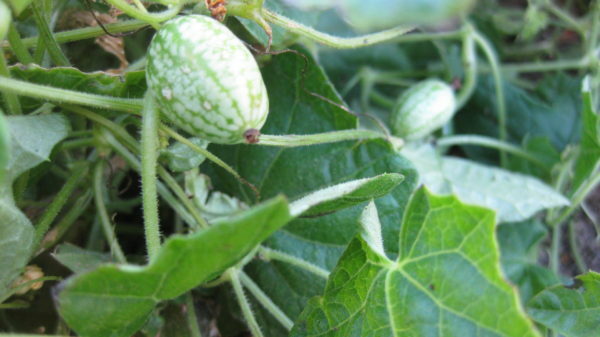 In Southern California, I grow it throughout the winter. In areas with harsher winters grow dill in the spring and fall. Parsley: A cousin of dill, parsley will grow throughout the winter in the southern states but should be grown in spring farther north. Parsley can live for two years but will turn bitter once it flowers. 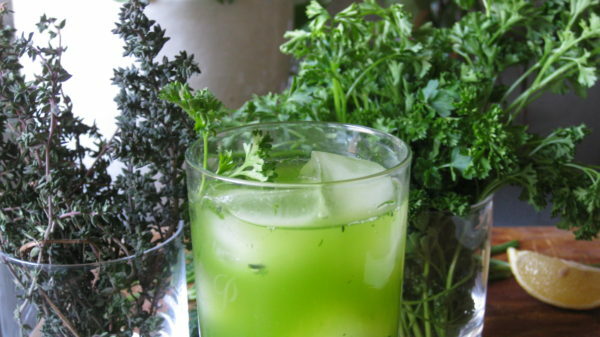 Cilantro: like dill, cilantro is easy to grow from seed. cilantro will grow happily until temperatures become too hot and it bolts. Cilantro seeds are the spice, coriander. To get coriander allow the cilantro to flower and form seeds. Once the seeds have dried some will fall and give you fresh cilantro next season, collect the rest and use in curries. 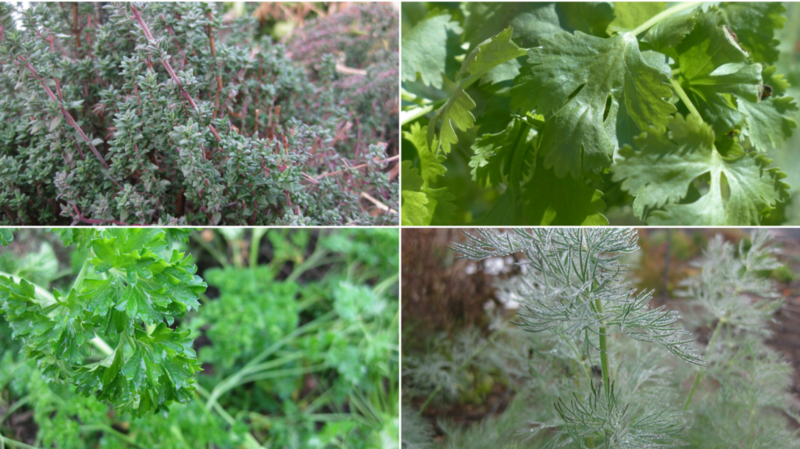 Clockwise from top left; thyme, parsley, cilantro, dill. I find that these intense herb flavors pair well with the botanical flavor of gin. I recommend skipping the bath tub brews and going with a decent quality London or Plymouth gin. In a shaker, muddle the herbs, lemon and sugar until the sugar is dissolved. Add gin and ice to above the liquid level. Strain into two collins glasses. Add two ice cubes to each glass and top with soda water. 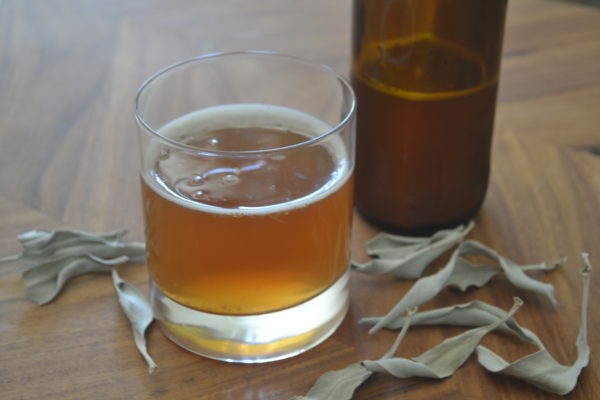 For another herbal cocktail recipe check out my basil cocktail. Gonna try this over the weekend. Looks delicious! Can’t wait!